Initial Registration Deposit - from £699 when you sign up. On arrival at Kilimanjaro Airport we transfer approximately one hour to our hotel. 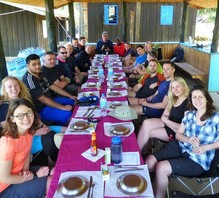 After freshening up we have a welcome lunch and meet our guides who will be leading the climb. In the afternoon there is the chance to relax by the pool before the welcome briefing and kit check. This evening we enjoy an evening meal together. 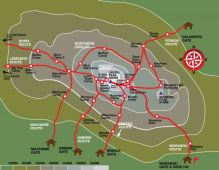 You will depart Moshi town after breakfast and head for Londorossi Gate to the West of Mount Kilimanjaro. The transfer will take around 3 hours. After signing into the National Park, you will continue up by vehicle to Morum Barrier Gate, on the Lemosho Glades. Upon arriving, we eat lunch, then begin our trek passing through heather and moorland which leads to your first camp on Mt. Kilimanjaro. The camp will be outfitted with private toilet tents and showers, allowing you to relax & acclimatise in comfort while enjoying the spectacular views of Kibo across the plateau. After a good breakfast, you will leave Shira 1 Camp on a light trek to Shira 2 Camp. This will again be a gentle day, ensuring you are fully adjusted to the mountain environment. The pace means you can drink in the views of this unique landscape, admiring the flora & fauna which is in abundant on every side. After arriving at Shira 2 Camp, lunch will be served against (weather permitting) a stunning backdrop of distant Mount Meru – Tanzania’s second highest peak, and the 5th largest in Africa. After a 2-hour rest, we will take a short 2 hour acclimatisation hike along the path towards Lava Tower Camp, before returning to camp for a hearty dinner. Better acclimatised, today we will walk for longer and go higher. 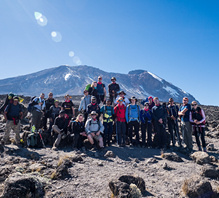 Trekking out from Shira 2 Camp, we will retrace our steps on yesterday’s acclimatisation hike, and make our way to one of Kilimanjaro’s iconic spots – Lava Tower. This ancient volcanic plug sits at 4600m, and is where we will take lunch. This is a significant gain in altitude, so expect to feel the effects of this, before we descend down to Moir Hut at 4200m. After yesterday’s altitude gain and descent from Lava Tower, today will be much simpler. 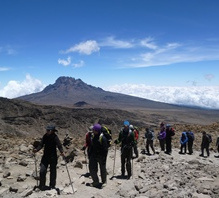 We will take a steep climb out of the Moir Valley, and skirt the northern slopes of Kilimanjaro. There will be altitude gains and descents, but no steep changes in altitude. We will come close to the border with Kenya, giving you unique views across the Tsavo & Amboselli Valleys. Arriving in to Buffalo Camp, we will settle in for a 3-course dinner before bed. Today we will continue our traverse of Kilimanjaro’s Northern slopes. 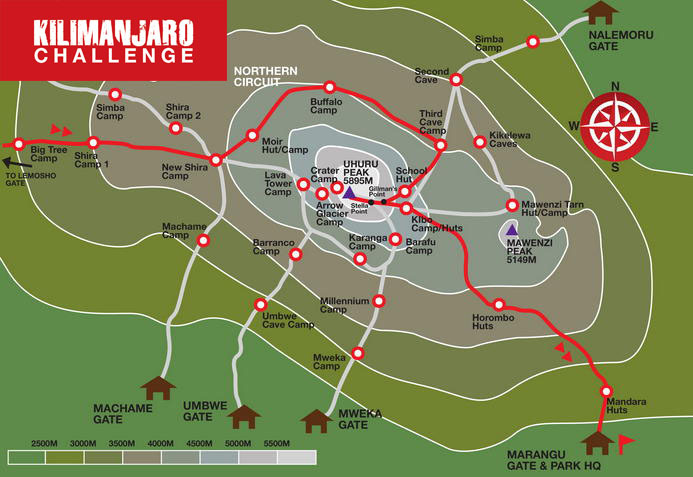 Here the route we are on converges with Rongai trail, so expect to see more trekkers along the way. Overall, this is a shorter day of trekking, allowing your body to fully adjust to the 4000m+ altitude. Today we will trek to the School Hut, otherwise known as the Outward Bound Camp. 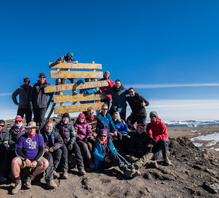 This sits at 4750m, and represents the highest point of the trek so far. This is also out last stop before the summit push. Arriving at camp, dinner will be served, and our guides will encourage you to get plenty of rest and drink plenty of water. After taking on some food, it will be time to get some sleep in our tents, resting up to gain strength before tackling Kilimanjaro's summit tonight. Expect a midnight wake-up call for our final push to the summit. After ‘breakfast’, we take a long trek up the winding path to crater rim. The slope is steep over loose rocks with some boulders as you near Gilman’s Point (5,712m). Each pair of trekkers will be assigned a personal guide for this part of the trek. The trek from Gilman’s Point at the edge of the crater, to the summit is less demanding, and depending on your pace, you can reach it after a further 1½-2 hours. After a short time at the summit of Kilimanjaro, you have the option, depending on time, to descend to a nearby glacier. Then we hike down to Barafu Camp via a different route for a short two-hour rest, before descending to Millennium Camp at 3820m. Here you will tuck into a delicious dinner, enjoy a refreshing shower, and settle in to your tent for a glorious night of rest after a stunning achievement. 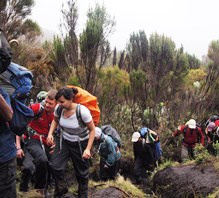 After breakfast, there will be plenty of singing and dancing with your team of Kilimanjaro guides and porters, as you make a final descent to Mweka Gate. The final section of hiking is a world away from yesterday’s barren summit of glaciers and cold, and you wind your way through lush rainforest, surrounded by birdsong and the chattering on Blue Monkeys. After signing out at the gate, you will board a waiting vehicle for a private transfer back to the hotel for lunch, showers and cold drinks. 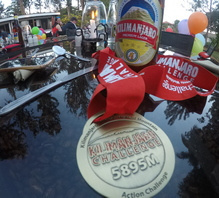 In the evening there will be a memorable celebration dinner, marked with Kilimanjaro medals, certificates and t-shirts. Please note: this Kilimanjaro itinerary may be subject to change.